Desolation Canyon is the ultimate place to become an official river rat. 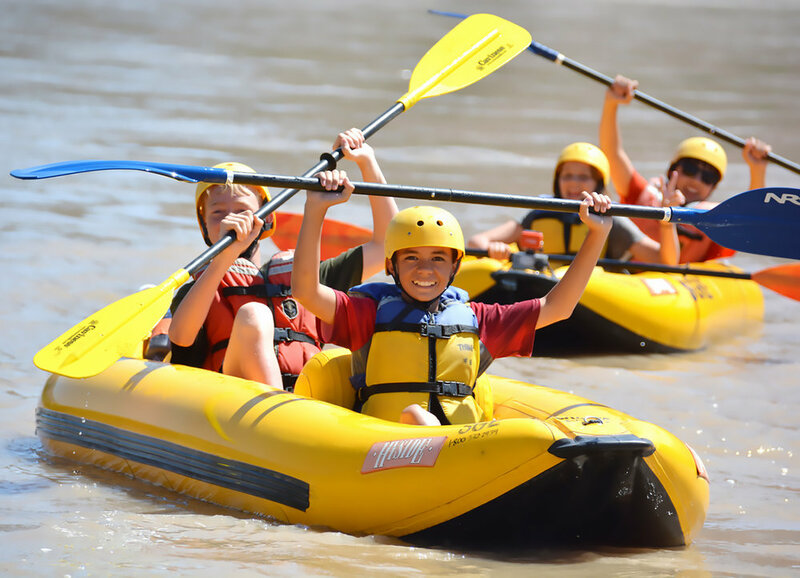 This is the place to fall in love with the river lifestyle - its' whitewater is comfortably challenging, its' history and lore is extraordinary, and its' walls are at one point deeper than the Grand Canyon at the Bright Angel Trail. A GOALS Desolation Canyon expedition begins with a scenic flight from Green River, Utah to the gravel airstrip at Sand Wash - offering a bird's eye view of the river below and the canyon landscape that surrounds one of the largest and most inaccessible wilderness areas in the lower 48. 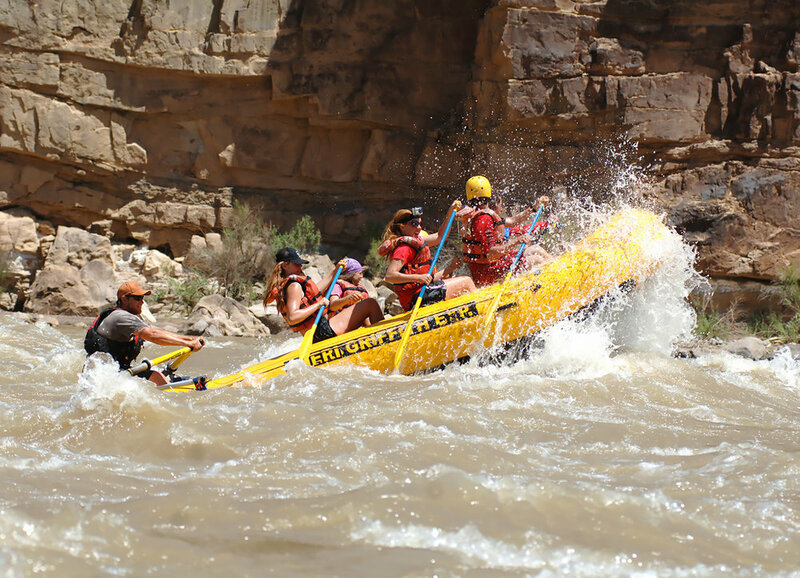 Following a short hike from the landing strip down to our boats, those who explore Desolation Canyon are treated to over 50 class II and III rapids that can be challenged in row boats, paddle rafts, or inflatable kayaks. We'll hike to old homesteads and ranches, examine some of the largest walls of petroglpyhs and pictographs in any river canyon, and tell ghost stories around the campfire of Butch Cassidy and many other infamous outlaws who frequently called the same beaches we're camped on home. This canyon should be looked at as a "good solid B+." You can find bigger whitewater elsewhere. Other canyons have taller walls throughout, or more varied wildlife. But few offer the overall combination that you'll find in "Deso", which makes it one of our favorites. Day 1. Travel to Green River, Utah. Meet at 11am on day 1 at GOALS world headquarters in Evergreen, CO - please arrive with a belly full of lunch. We’ll drive about 6 hours to our campsite at Green River State Park in Green River, UT, where we spend the night before our river launch. We’ll stretch our legs with some frisbee and football, and if there’s time we may visit the John Wesley Powell history museum- a local treasure with great exhibits detailing Powell’s brave expeditions in 1869 and 1871 that explored the same river canyon we’re heading for, as well as telling the stories of many other river pioneers. 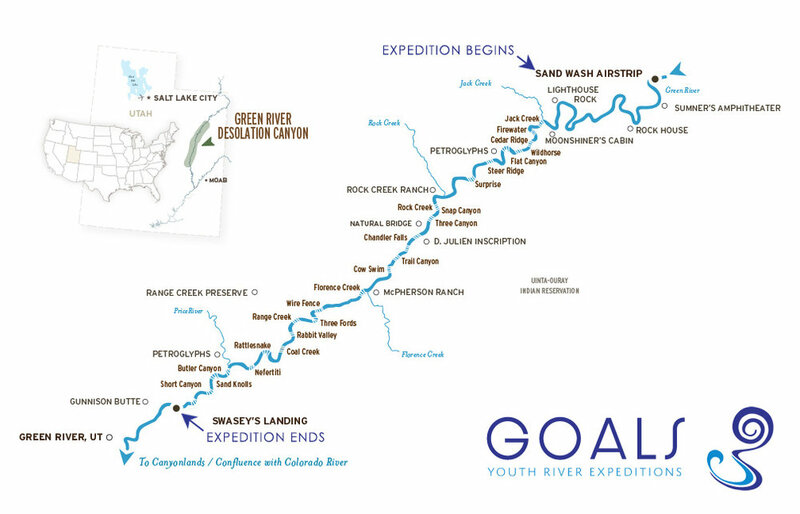 After dinner at Ray’s restaurant (famous among “river rats”), we’ll camp tonight at Green River State Park, and will begin the GOALS curriculum by creating a group oath together that sets our group apart from every other GOALS group. Although we’re all excited for what is to come, a good night’s sleep is important - tomorrow is a big day that starts with a scenic flight and ends deep in the heart of Desolation Canyon! Day2. Flight, then float. We awake early today to begin our adventure. Once camp is packed up, we’ll drive out to the Green River airfield and await our pilots, who are flying in from Moab at 7am to pick us up. Upon their arrival, we’ll board small planes and buckle up for an amazing flight that takes us directly upstream over the canyon we’ll spend the next 6 days floating through - offering a birds-eye view of the entire landscape and geology that make up Desolation and Grey Canyon. After landing on the runway high atop the plateau at Sand Wash, we’ll hike about 45 minutes to the river - where we meet the rest of our professional river guides and launch onto the Green River. We’ll enjoy lunch as we float, then take a short hike to an old wooden skiff on the left bank that remains from the Powell era. 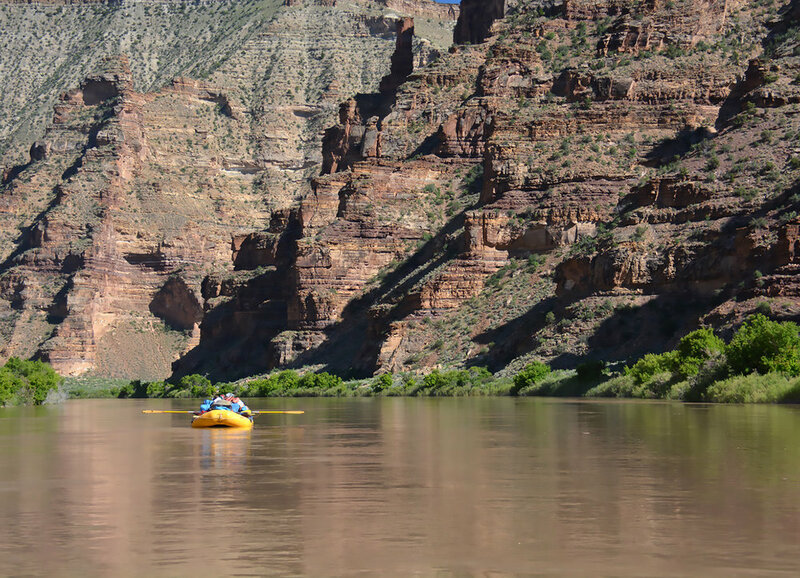 Today’s float is almost all flat water, a comfortable introduction to the beauty of Desolation Canyon as the sandstone walls tower taller overhead with each passing mile. We’ll explore about 26 miles today - camping in a beautiful spot called Jack Creek on river right in a grove of old cottonwoods that seem to have stories to share from some of the early explorers we’ve learned about in our first two days. Day 3. Introduction to whitewater and ancient messages. We begin day 3 with a thorough safety speech from our guides, then ask everyone who’d like to paddle “duckies” (inflatable kayaks) through the rapids we’ll begin encountering today to prove that they’re capable through the “flip test.” Our morning includes exciting rapids with great names including “Firewater” and “Cedar Ridge” (both named after the side canyons that formed them) and “Wildhorse” (paying homage to the large wild horse population that still occupies Desolation Canyon. Opportunities exist today for two fantastic hikes. The first is in Firewater Canyon to an old moonshiner’s cabin that still has boots, clothing, and distilling equipment to remind us of earlier days when the area was frequented by outlaws and others seeking refuge from law enforcement. The second is at Flat Canyon, where we’ll try to interpret the messages created as petroglyphs carved into stone about 1,300 years ago by the Fremont cultures who lived here. The Flat Canyon petroglyphs are known as some of the best in any western river canyon. 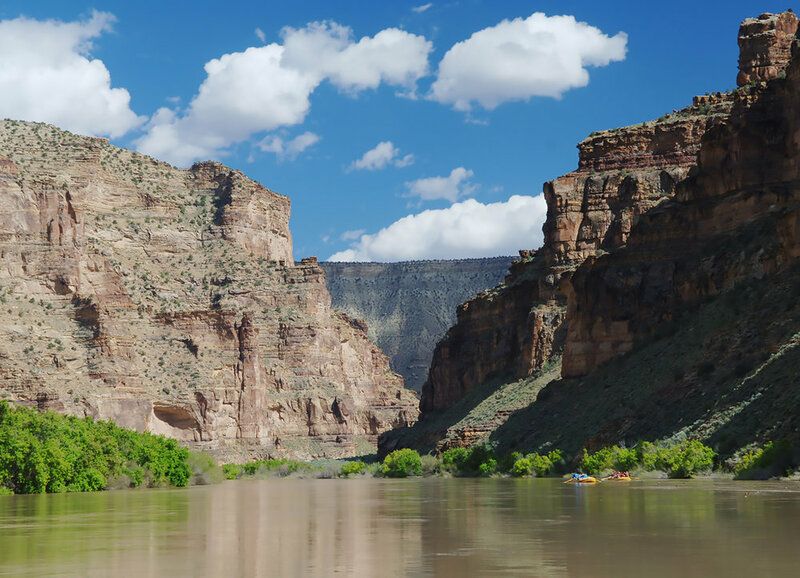 We’ll likely enjoy lunch here, then navigate exciting rapids called Steer Ridge and Surprise before pulling into camp at Log Cabin, a beautiful campsite on river left with enormous soft sand beaches and outstanding views of the canyon looking both downstream and back up. Day 4. Meet the Seamounts and McPhearsons. Day 4 is another day that features fun rapids and fascinating history. Less than a mile downstream from Log Cabin, we’ll hike up Rock Creek to another large set of ancient petroglyphs - looking for similar inscriptions to those we saw yesterday at Flat Canyon. After leaving Rock Creek, we’ll float a very short distance to Rock Creek Ranch, the historic home and ranch of the Seamount family - a name that surfaces frequently in Desolation Canyon’s early history and lore. It’s fun to imagine what life at Rock Creek Ranch might have been like 100 years or so ago, and to talk with kids about whether they’d enjoy growing up amid the simple pleasures and hard work that would have existed for the Seamount children. 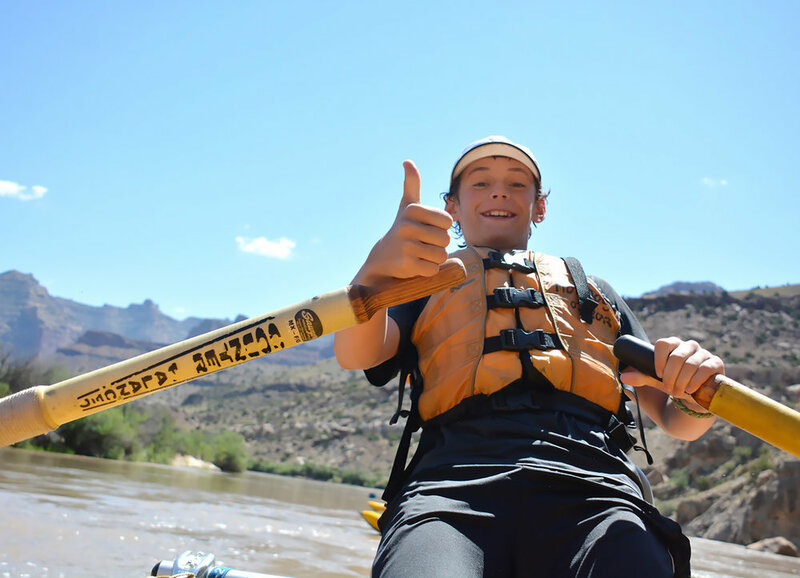 After leaving the ranch, we encounter splashy rapids and big waves in Snap Canyon and Three Canyon, then enjoy a “lunch-over” in the Chandler Canyon area - arriving at tonight’s camp for a late lunch that affords lots of time for games, journaling, sketching, etc. One more short hike for those that are interested takes us to the natural bridge in the abandoned meander near Chandler Canyon - a unique geologic feature that shouldn’t be missed. Day 5. Rapids Day! Today, the canyon opens up as we exit Desolation Canyon, then the walls build again as we enter Grey Canyon. The skills and confidence we’ve built so far will be put to use as we tackle the “big three” - our most challenging (and most fun!) rapids of the expedition in Joe Hutch (also called “Cow Swim”), Wire Fence, and Three Fords. Before arriving at the first of these three (Joe Hutch) and hiking to scout the rapid, we’ll float past Florence Creek and the old McPherson Ranch - the site where Jim McPherson raised a family and aided many of the area’s famous outlaws, including Butch Cassidy and the Sundance Kid. This is also the site where a citizen posse apprehended the famous Flatnose Curry and shot him dead in his bedroll. Our campsite tonight will be in the Rabbit Valley area - with lots of celebrating around a campfire after getting through today’s exciting whitewater! Day 6. Coal Creek & Rattlesnake. After a big day of scouting and navigating some of Desolation Canyon’s best whitewater yesterday, today is a relatively short day on the river. While the number of miles we travel today are small, the excitement is high, as there are two more thrilling rapids that lie downstream - Coal Creek and Rattlesnake. Since we’ve put in a few longer days upstream, we’ll be to our beautiful camp on river left just under Rattlesnake by lunch time, and have the entire afternoon - the last of our trip - to enjoy. The day will be filled with games, learning activities, a hike, etc. - and this evening we’ll close up our expedition with some long-standing GOALS traditions that solidify connections to peers, planet, and self. Day 7. Green River Daily and a long journey home. Today, we’ll raft our final section of the Green River - ultimately coming out of the canyon and approaching the agricultural landscape of Green River, Utah. 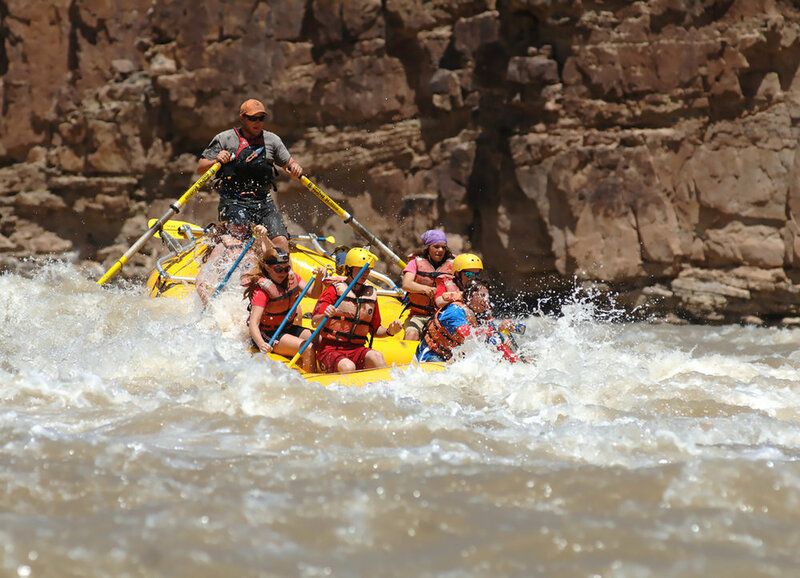 Before we get there, we’ll enjoy the splashy and fun rapids that make up what many local companies refer to as the “Green River Daily” section. We’ll also enjoy a short hike to one last robust set of petroglyphs at the Price River confluence. Lunch will be served in the canyon, before we apprehensively paddle toward the take-out at Swasey’s Beach. Once we arrive, we’ll help our professional guides load gear onto trailers, give big hugs, and then head toward home - generally arriving back to Evergreen between 8 and 10pm. GOALS all-inclusive rates go beyond the unrivaled on-river experience. They also include all transportation (ground and air), lodging/campsites before and after the expedition, and all meals both on the river and on the road during our travel to/from the canyon. A detailed list of all inclusions (gear, government fees, supplies, etc.) is listed below. Transportation from GOALS world headquarters in Evergreen, CO to Green River State Park campground in Green River, UT at the beginning of the expedition and from Swasey’s boat ramp near Green River, UT back to Evergreen, CO after the expedition. ALL MEALS - from dinner on day 1 through dinner on day 7. This includes all meals on the road and in the canyon (6B, 6L, 7D) - and accounts for all dietary restrictions and preferences. No need to send kids with road money for anything other than snacks. Campsite at Green River State Park in Green River, UT on night 1. Transportation to the Green River Airfield. Scenic flight from Green River, UT to the river put-in at Sand Wash. Vehicle shuttle from Green River Airfield to the take-out. All launch fees and government use fees for Desolation Canyon. All the high-quality gear needed to be safe and comfortable in the canyon, excluding sleeping bags (which can be rented if necessary). Every participant will be afforded the use of a dry bag, personal flotation device, tent, camp chair, sleeping pad, and all river/kitchen gear needed. Professional, licensed, and experienced river guides who know the GOALS curriculum and objectives. GOALS curriculum journal and program t-shirt. The sense of accomplishment for so many that they've just completed their first "real" river expedition.